Yacht trip to one of the most beautiful beaches in the region. 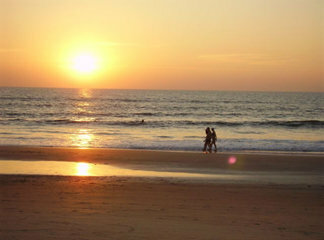 The Varca Beach is situated in Benaulim in South Goa. The longest stretch of unpolluted water the Varca Beach is another famous tourists destination in the beach capital of India. A charming white sandy beach with mesmerizing views of nature the Varca is a perfect holiday spot for honeymoon holidaying. With beautiful palms surrounding the serenity of the beach the Varca is ideal for dolphin watching, sunbathing. Varca is the perfect location for all these holidaymakers who are searching for a place to escape from the mundane tensions with the daily life. The elegance of nature, mixed using the melodious gushing of the aqua waters, would make the experience of going to the beach a memorable.